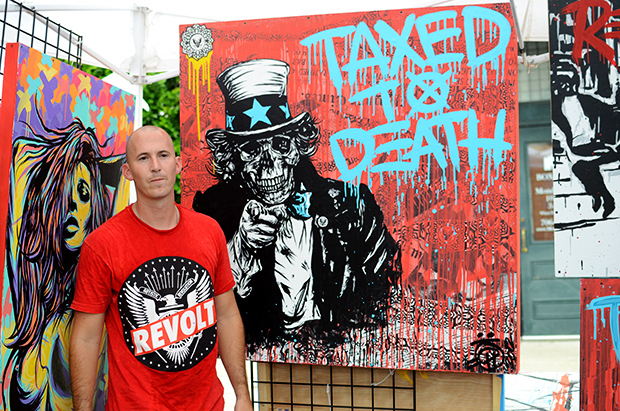 California, born fine artist, and self confessed street "artist" CHRIS HOBE', also known by the underground pseudonym HOBE' or ARTREVOLT, creates a box for the world to think outside of. Through usage of vibrant color combinations within eclectic and historical themes, his works are painted with oil, acrylic and spray paint and applied to custom crafted framed wooden canvases that Chris makes by hand. HOBE's body of work stretches across the US and has been shown at several well known venues and establishments, including collaborations with the W Hotel Midtown ATL, Jack Daniels, Svedka Vodka, Bombay Sapphire, Halo Lounge, Atlantic Station and Mellow Mushroom to name a few. HOBE's dogged pursuance of perfection within his various art forms has seen him travel the southeast extensively, looking for inspiration wherever he can find it. Currently based out of Atlanta, Georgia, HOBE's ultimate desire is to encourage the youth to achieve their greatest potential despite adversity, and to enrich the lives of others through the beauty and subliminal messages of his art.